The Catholic University of America men’s basketball team won a tightly contested matchup against the Eagles of Juniata College, 61-53. The home victory on Wednesday, February 6 was crucial in keeping CUA’s playoff hopes alive as the team sits in a heated playoff race for the fourth and final spot. The team now sits with a 9-13 (5-6 Landmark) record, putting them two games behind Scranton and Susquehanna. The Juniata side has also seen its struggles this season, as the team sits in the second spot from the bottom with a 8-14 (2-9 Landmark) record. Despite the difference in season prospects, the two teams are even statistically and share a similar aggressive play style, which showed through how competitive the game was. The first half of the game got off to a very cold start, with neither team finding the basket for the first four minutes of the game until freshman guard Will Mulquin hit a corner three on an assist from sophomore Collin Hartmann. Each team would trade both scoring runs and momentum throughout the opening period play. By the end of the first half the score was tied at 24-24. Junior center Riley Hayes was a force underneath the basket, recording a double-double with game highs in points (19) and rebounds (16). Hayes shot 7-of-10 from the field an 5-6 from the charity stripe and scored 11 points and grabbed 10 boards in the first half. In the second half of the game, the team relied on its two seniors Andre Mitchell and Jimmy Golaszewski to seal the game down the stretch. Mitchell recorded 15 points, 4 assists, 4 boards, and 3 steals on the night. Mitchell also shot 5-6 from the free throw line, almost all of which came in the game’s concluding 30-seconds. Golaszewski scored all 8 of his points in the second half but made many gritty plays that do not show up on stat sheets in order to seal the win. One such play came with just under 2:20 to play in the game, when Mitchell went 1-2 from the stripe to tie the game at 53 all. On the ensuing possession he stole the ball from a Juniata defender and hit a pull up jumper to give CUA the lead of 55-53. He followed this up with a key defensive rebound which Golaszewski converted into a lay-up to build Catholic’s lead to 4 points, 57-53, with :37 on the clock. The two would combine for the Cards’ last 9 points in the final 2:30 minutes of play. Mitchell would go 4-4 on free throws down the final 30-seconds to ice the game at 61-53. The Catholic team will travel to Selinsgrove, Pa. as it plays Susquehanna University on Saturday, February 9. The matchup will have huge playoff implications as both teams are vying for the final spot with only 2 games left in the season remaining following the tilt. Susquehanna has been strong all year, boasting a 14-8 (7-4 Landmark) record. Catholic managed to secure a 78-74 home win the last time the two played on January, 19. 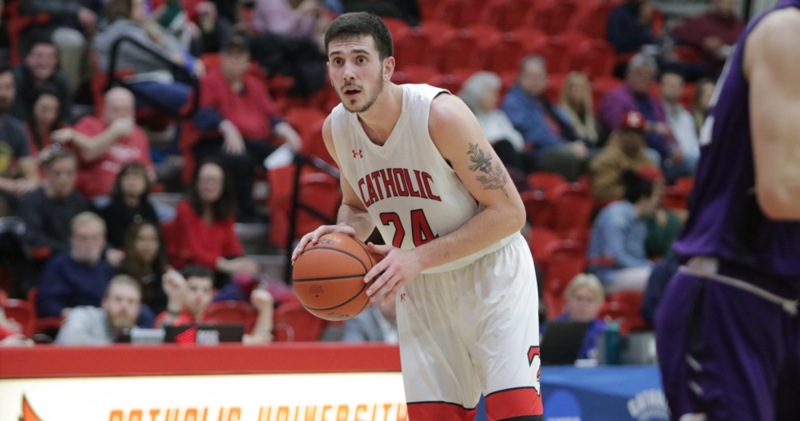 CUA was victorious on the back of Mitchell’s season high 30-points, including the 1,000th of his career, the team’s last matchup with Susquehanna, and it will need a similar performance to sneak into the postseason.